#BackToSchool : Lunch Is Served! We received these products for review purposes. As always all opinions are honest and those of mine and JustaBXgirl. I don’t really classify JustaBXgirl as a picky eater because I can normally find something she will eat anywhere. She is, however, a very, very choosy eater. She might enjoy eating something one day and then decide the next that she will never eat it again. That just happened with french fries. Yup, I have a four-year old that refuses to ear french fries and chicken nuggets…gasp! Knowing how fickle her taste buds can be I have to admit that I have been worried about what she will do for lunch at school. We are blessed that the school she is going to be attending allows me to send her with lunch daily. Now, it’s up to super mom to figure out daily lunches that don’t have peanuts or shellfish. One thing I don’t have to worry about is how I will be sending the lunch. JustaBXgirl has plenty of options on how she will be bringing her lunch to school and I wanted to share a few of those options with you. Zip & Zoe – Daisy Dragon Face Lunch Bag and Ice Pack – You might remember that we are huge Babymel and Zip and Zoey fans. I can be found with my diaper bag turns mom bag ALMOST as often as JustaBXgirl can be found with her Daisy Dragon (aka pterodactyl) mini backpack. The backpack is too small for her to use daily once school begins but that doesn’t mean that Daisy has to stay home. Daisy can now be responsible for carrying JustaBXgirl’s lunch to school and keeping it cool with the help of a really cute ice pack. I really like the inside drink bottle compartment. Bixbee – Hope, Peace, Love Lunch Bag – When this arrived in my Sweet Suite swag box I immediately fell in love with it. I love the idea of sending JustaBXgirl to school with reminders of peace, hope and love. It is really hard for me to let my baby go for hours at a time but knowing that some of the first words she will learn to read might be those on her lunch bag make me smile. I also enjoy the space that comes with this bag. It has an outside pocket that I can pack napkins and cutlery. Stuck On You – Large Bento Box – Did you know that JustaBXgirl will not eat food that touches? Yup, add that to her list of peculiarities that make her so special. At home, this isn’t an issue because we use divided plates I wondered how I would work it out for school. Stuck On You came to the rescue by creating this really cool, personalized option. Rubbermaid – Brilliance Food Storage Containers – These are so freaking awesome!!! These are perfect for everyday use at home. And they are going to work great for sending JustaBXgirl food to school. They even have a salad container that works very similar to the bento box but with smaller portions. The containers seal and become spill proof. Contigo – Autospout Gizmo Straw Flip Water Bottle – I’ve already shared how much we love this bottle. Holding 14 ounces this bottle will definitely be a good way to keep your littles hydrated. 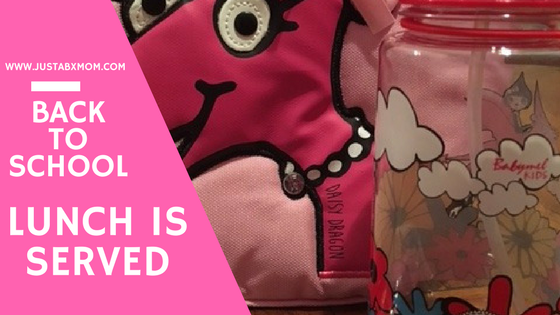 Zip & Zoe – Water Bottle with Straw Floral Brights – We love to coordinate so of course, we wanted to add the Zip & Zoe water bottle that features Daisy Dragon to JustaBXgirl’s supplies. I love the wristlet it comes with to hold it and this bottle fits easily into cupholders. Nalgene – Captain America Water Bottle – Superheroes aren’t just for boys. JustaBXgirl is a Marvel fan thanks to her godfather and godbrother. She has been using this bottle around the house and needs a little help opening and closing it so I’m not sure if we will be sending it to school but it will make a great backup for when she loses one of her others. JustaBXgirl is a fan of the plain water. I like the fruit flavors as they remind me of infused water. RETHINK Boxed Water – Because sometimes this mama forgets to fill up the water pitcher. On those days I can simply grab a box of RETHINK water from the fridge and throw it in one of her lunch bags. If you’re interested in trying out RETHINK then make sure to enter the giveaway below. The winner will be contacted within 24 hours of giveaway ending. Prize will be mailed directly from the brand representative. Giveaway is open to all US residents 18+ excluding Hawaii and Alaska. I saw your IG with that water. It looks interesting. I want to try it for my mini. I love all of these cool school items too. The lunchboxes are cute. The flavored waters remind me of infused waters. I’m already having nightmares about what will go in the lunchboxes! The water boxes are great to grab and go. I’m expecting losses that is why everything is labeled and we have extras! The quality of food served by school lunchrooms across the country is appalling.